Summary: A paper thin plot shows off how well this show still works even without the more in-depth workings of other serialized dramas. The Flash faces a new meta-human named Tony Woodward, who can turn himself into girded steel at will. Barry actually knew Tony in grade school and was bullied by him, frustrating and angering Barry now more than usual. While Dr. Wells and Caitlin are concerned about Barry’s safety, Cisco comes up with a plan to take Tony down: if Barry runs at mach one speed at just the right angle, he can use a supersonic punch. Meanwhile, Joe asks Dr. Wells to help him solve Nora Allen’s murder, when in reality Joe suspects Dr. Wells. Wells catches on, and instructs Joe to look into Tess Morgan, she was Wells’s old lab partner who died just before Wells moved to Central City, giving him an alibi and explaining why he ended up here. Meanwhile, Iris’s blog on The Flash gets her into trouble when Tony, remembering her from school, decides to use her to find him Flash and finish him off. 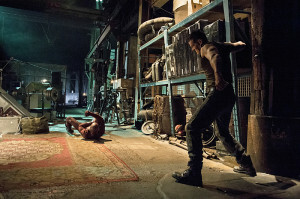 Flash manages to use his supersonic punch to defeat Tony, with help from Iris. 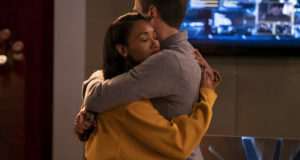 Afterwards, Barry and Iris reconcile after last week’s fight, and Barry suggests a new name for The Streak: The Flash. Joe gets a visit by the yellow and red blur that killed Barry’s mother, stealing all his files and threatening Joe with a photo of Iris with a knife in it, “STOP OR ELSE” carved above. One of the joys of The Flash‘s premiere season has been seeing how it differentiates itself from Arrow, even while keeping in the same feasible universe. For example, “The Flash is Born” is sort of the antithesis to last week’s Arrow installment, “Guilty,” at least in a broad sense. That particular Arrow episode struggled to hammer in its themes and parallels to make sure we knew we were watching a structured story worth analyzing and picking apart. Arrow is normally better at presenting intersecting themes and parallels, but “Guilty” is a good example of what The Flash specifically hasn’t been doing — and yet has still managed to find success without. “The Flash is Born” is incredibly straightforward, telling little more than a story of Barry confronting a childhood bully and the chaos surrounding it. To be honest, that The Flash doesn’t offer a whole lot in terms of more artful subtext could be an easy criticism, considering that’s become quite a given in serialized dramas. When we do get themes, they’re incredibly simple and spelled out right at the top. But The Flash very consciously avoids ambiguity or general writer-y techniques, and does so with a purpose. These are much more character-focused stories, in the sense that everyone is allowed to do their own thing, without the constraint of it tying into an overarching point. The way the characters have been set up in Barry Allen’s world is solid enough that this works, because everyone has rather clear roles, goals, and connections to the other characters. So something like “The Flash is Born” has room to breathe, with the characters not tied together by a poetic thread, but simply by the narrative that’s unfolding. That simplicity is part of what makes The Flash successful; it’s very much a throwback to old fashioned comic books and superhero stories, often favoring flash (heh) over substance. The Flash treads a fine line between dialing up the camp and still keeping it grounded — in part because it does have its roots in Arrow — and that allows it to strike a balance between feeling too much like a children’s show and being too grim. It’s the closest thing we have to the tone of most Marvel movies on TV (yes, even counting Marvel’s Agents of S.H.I.E.L.D.) in that it captures the essence of fun, but doesn’t feel dumbed down to do it. All the characters are likeable, the actors are competent and charismatic, and the plots are flashy enough to keep us distracted when they don’t make a ton of sense. This plot is even more simple than usual, and one that would be contrived if it wasn’t presented in this way. It was only a matter of time before we got a metahuman with a direct connection to Barry, and making him a bully allows the show to very easily recreate the dynamic presented in the flashbacks. Is this too easy of a set-up? Sure, but it allows a certain freedom for wish fulfillment. It turns out that every primary character under 30 was the subject of bullying for one reason or another, and we can take solace in seeing a victim finally getting back at the person that tormented him during their most awkward time. There’s absolutely no ambiguity or deeper reasoning behind Woodward’s villainy, it’s completely black and white. He’s a bully, bullies are mean, and our hero takes down the bully. It’s childishly simple, but it grants Barry and the viewers who relate a certain triumph when he’s beaten. It’s manufactured engagement, sure, making Woodward the most stereotypical and unambiguous of bullies. But does that really matter so much as long as we’re still engaged? It doesn’t give much to talk about critically, but The Flash has been clear that it isn’t yet the place to turn to for musings about morality or human nature. It’s about a hero beating the odds to take down the bad guy. The challenge of each episode is to make Barry’s inevitable win triumphant, and “The Flash Is Born” does that just fine. This is reflected in Iris’s naivete in her coverage of The Streak The Flash, which consistently points out that he’s a hero that the city needs, etc. etc. It’s the same old superhero story, with the oft-tread rooftop conversations, and a constant awe to the proceedings. There’s nothing much below the surface here — she’s probably how most of us would react if a superpowered hero took genuine interest in us. She just thinks he’s cool. Other than Candice Patton’s charismatic performance, that’s what’s made Iris really work as a character so far, even when she doesn’t contribute much to the plot. Unlike Cisco’s indulgent fanboy qualities (which are spot-on this week, but have often been grating in the past), Iris is genuinely entranced with the overall wonder of Flash’s existence. She also just-so-happens to be in a position where he’s also going to get close to her. That finally comes to a head this week, when her blog actually does get her in trouble like Joe worried she would be in weeks past. But even though she falls comfortably in the position of damsel, she’s still pretty smart; that fire alarm move might have worked if she wasn’t facing a super strong metal man, and she even gets to land the last blow at the end. It’s hard to make a non-superhero love interest not totally useless without shoehorning strength into the story, just because of the archetype, but so far Iris has worked. She feels like her own character, but not one that’s played up as too strong or capable. She’s just, you know, a person. Her father gets a bit to do as well. 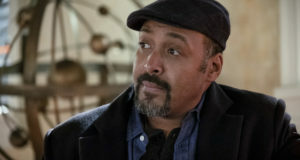 Jesse L. Martin is always fun to watch, but it’s great to see him able to take on the main story arc’s reigns for a while while Barry is off saving the day. It’s actually a nice set-up, because it means we can have Barry following completely different story threads without it seeming like he’s ignoring the primary goal of uncovering his mother’s murder. With Joe on the case, there will always be plot momentum going on in the background, it will always give something else for Martin to do, and it won’t impede on any other plots unless it needs to. It’s a smart way to keep the serialized stuff while still keeping the aforementioned simplistic narrative. It’s especially great to see Martin having scenes and camaraderie Tom Cavanaugh, as both are easily the best and most distinguished actors in the cast. So far The Flash has given a wealth of material to its…erm…”old” characters, compared to standard CW shows, and as such, it’s a joy to see Joe and Dr. Wells furthering a relationship. 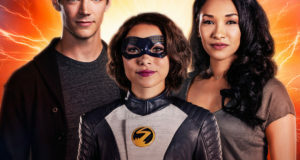 That relationship might lead to some bad stuff down the line, of course, as Dr. Wells might be the factor that will eventually shake The Flash out of its lighter fare. 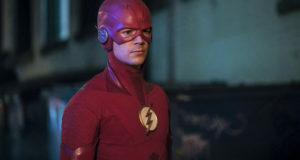 This episode attempts to shoot down the common theory that Wells is the mysterious speedster from Barry’s origin, though it certainly doesn’t disprove it. If anything, it makes Wells even more of an enigma by giving him some semblance of a backstory. Wells is the secret weapon of the show, or perhaps a ticking time bomb, because with each episode it’s both easier and harder to tell if we’re supposed to think of him as more of an outright villain or a misunderstood sympathetic good guy. As time goes on, the progression of Dr. Wells’s storyline will surely amp up the storytelling and create some meatier plots. The Flash could certainly be something more, and chances are it will become more daring and experimental with age. But right now, it’s fine doing what it does. “The Flash is Born” probably isn’t the best hour of the show, but it’s not bad or unentertaining in the least. 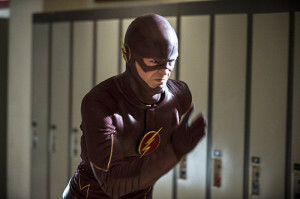 It’s average at best, and five episodes in, The Flash‘s average is still damn enjoyable. Iris’s voiceover isn’t bad, but I’m not sure Candice Patton’s reading really worked. Out of Stephen Amell, Grant Gustin, and Candice Patton’s respective voiceovers, Gustin is still the winner by a mile. Even with some rubbery-looking CGI on Barry, for the most part the entire supersonic punch (including the city of broken windows) is nicely rendered. Do Barry’s powers also give him a heightened awareness of how far he’s travelling? How is he able to tell when he’s run precisely 5.3 miles away? I mean, I can tell if I’ve walked a few feet, roughly, but nothing so specific. Still not really worth talking about, but this is about the most we’ve seen of Eddie Thawne acting like a real person. He gets some good bits, actually; there are clearly gears turning when Eddie sees Barry show up after taking the “shortcut,” and Rick Cosnett is kind of adorable when he’s helping Barry with the punching bag. His deep voice still sounds like a villain whenever he talks, though. I totally get the triumphant moment of the bullied kid telling off the bully, but I have to wonder how much Barry thought the “no secret identity” thing through. Then again, if I were in his shoes, I’d totally do it, too. Do people even have follower counters like the one on Iris’s blog anymore? It looks like an old hit counter from a Geocities or Angelfire site. “Interesting. A man of steel.” I didn’t want to chuckle, but I did anyway. So far, I seem to be the only one to notice the sign in Keystone City that said “Garrick’s Warehouse,” or at least the only one to mention it. Did you guys catch that and just leave it out of the review, or is this something that you may have overlooked? I had misgivings about the show; the Flash is a long-time favorite. The trailers hooked me, and my wife was drawn in by Tom Cavanaugh – we both loved the show Ed. Anyway, the misgivings vanished with the pilot. Grant Gustin plays a great Barry Allen. The friendship between him and Candice Patton really works. Jesse Martin has the right touch of gravitas. But it’s Gustin’s Flash that makes the show. And the supersonic punch, and the moments leading up to it, were pitch perfect. As soon as he stopped running and started to brace himself for the run, I got goosebumps. What DC does right on the small screen is allowing the audience to care about the characters. They did it with Smallville and they’re doing it again here.